Should you care to list my brother-in-law and sister, please do. I would certainly be appreciative as might their daughter and grandchildren. 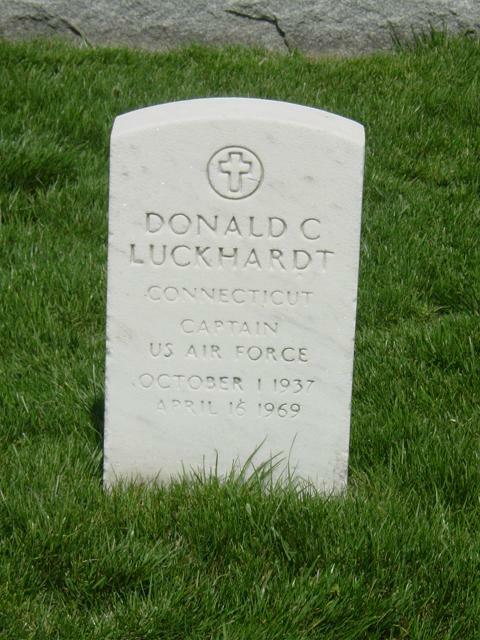 Captain Donald C. Luckhardt, United States Air Force) was born in Connecticut in 1938, served enlisted tour in the Navy, then attended the University of Connecticut, graduating in 1960. Upon completion of Air Force OTS at Lackland, Air Force Base, he was Commissioned in the United States Air Force. As an Air Force Security Police Officer, he was first assigned to Whiteman Air Force Base in Knobnoster, Missouri, then to Sevilla Spain where he served for 6 years. Upon returning from Spain, he was on orders to Vietnam, and on leave enroute when he and my sister were killed in an auto accident near Hopewell, Virginia. My sister, as a good Army brat, grew up in various bases as my Dad, George Everett Sylvester, Lieutenant Colonel, United States Army, trained for World War II, California, Texas, Mississippi, Louisiana, Florida, Austria...etc., she attended Florida Southern and graduated from the University of Connecticut in 1960. The mother of two children, both of whom were in and survived the car crash, she is buried together with her husband, also in Section 4 of Arlington. They both passed away in April, 1969. Their surviving daughter (one also died in a subsequent car wreck in Texas in 1971) lives in West Hartford, Connecticut, and has two sons.